There have been rumors for the past few months that a big tech firm is looking to acquire Waze, a popular traffic navigation app. 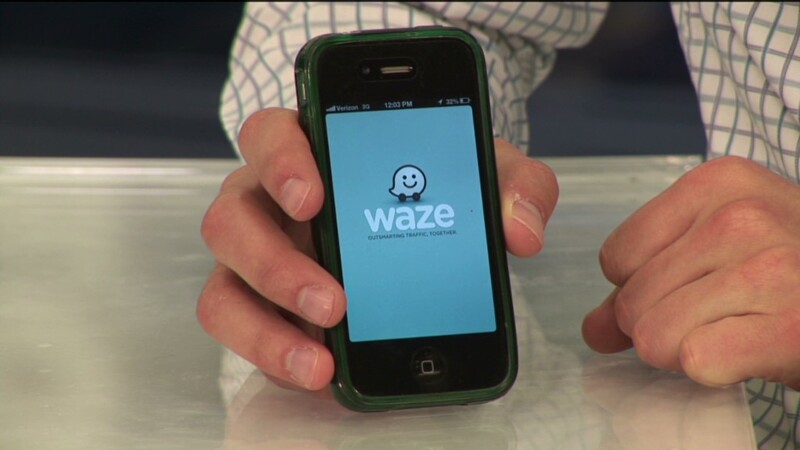 Most recently, rumors that Google (GOOG) is interested in Waze have been making the rounds. But Apple (AAPL) and Facebook (FB) have also been named as possible bidders. So why is there so much buzz about Waze? The company, which initially launched in Israel, provides crowdsourced information. Users can wave their hands over their mobile device while driving to vocally report traffic or hazardous conditions. Updating in real time based on that information, the app delivers accurate assessments of current traffic, road closures, and alternative routes efficiently. "What a lot of people don't know about Waze is on the front end we're an app, but we are also making our own maps. This is something very few people can do," said Di-Ann Eisnor, vice president of platforms and partnerships for Waze. "The two [companies] that are really in front in real time mapping are us and Google, so we each actually have our own maps and people don't know that." It's no surprise that Google is reportedly the latest bidder for the quickly growing startup. Eisnor declined to comment on specific acquisition rumors but emphasized that part of the company's perceived value is the fact that it gets so much information from its loyal base of 50 million users. Apple's botched attempt to launch its own mapping app also bolstered the company's profile. After Apple's iOS6 mapping app was plagued with inaccuracies, CEO Tim Cook recommended some alternatives and specifically gave a nod to Waze. "It ended up really in our favor. Tim Cook came out, apologized for Apple maps and then recommended the use of Waze... for a startup this is incredible," Eisnor said. "But what happened was it highlighted how difficult it is to make maps." Eisnor admits that being the subject of ongoing speculation hasn't hurt. "As long as you have a strong business, you have your head down, you're working hard and you're building something amazing, you get to keep doors open," she said. Waze already has ties to key players in tech like Facebook. An existing partnership enables users to share their driving routes with friends on the social network. Eisnor also says the company is taking on global issues, working with the U.S. government and Congress to figure out how to reduce and measure traffic congestion. The data gathered in the app can help create smarter cities by building better road systems and assisting in disaster relief. After Superstorm Sandy, Eisnor says the app was able to push out valuable information -- like how long the lines were at gas stations -- to users. As smartphones continue to dominate the market, Eisnor says maps and GPS navigating are at the forefront of innovation ... and that's why Waze's name keeps popping up as a takeover target. "What search was for the Internet, maps really are for that whole mobile experience." she says. "So I think what the rumors have done is underscore the importance of what we're building."